Warner Bros. Home Entertainment, A Very Good Production and Red 56 have begun principal photography on Nancy Drew and the Hidden Staircase, an all-new feature film that returns the American icon to filmed entertainment for the first time in more than a decade. The production is based in Georgia filming at specific locations in and around the city of Monroe. 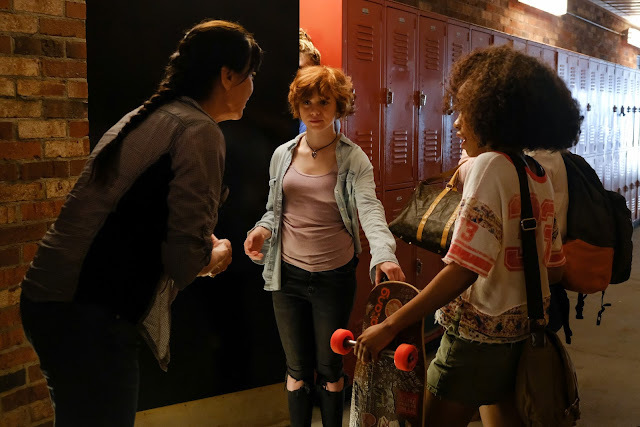 The film focuses on Nancy Drew (Sophia Lillis, the breakout star of It), a smart high schooler with a penchant for keen observation and deduction, who stumbles upon the haunting of a local home. A bit of an outsider struggling to fit into her new surroundings, Nancy and her pals set out to solve the mystery, make new friends and establish their place in the community. Nancy Drew and the Hidden Staircase is a co-production between Warner Bros. Home Entertainment, Ellen DeGeneres’ A Very Good Production and Red 56. Award-winning director Katt Shea (Poison Ivy) helms the film from a script by the screenwriting team of Nina Fiore & John Herrera (The Handmaid’s Tale, The Vampire Diaries). Ellen DeGeneres (The Ellen DeGeneres Show), Jeff Kleeman (The Man From U.N.C.L.E.) and Chip Diggins (A Walk In The Woods) are producers. Wendy S. Williams (The Fate Of The Furious) is executive producer. Zoe Renee (The Quad) and Mackenzie Graham (SYFY’s upcoming The Purge) are featured as Nancy Drew’s core BFFs, George and Bess, respectively. Laura Slade Wiggins (Shameless) portrays Helen, a high school mean girl who reluctantly joins forces with Nancy to help solve the mystery. The film spotlights True Blood star Sam Trammell as Nancy’s father, Carson; Linda Lavin (Alice) as Flora, the owner of the haunted house; and Andrea Anders (Joey, The Stepford Wives, Better Off Ted) as Nancy’s Aunt Hannah. The cast also includes Jay DeVon Johnson (Vice Principals), Andrew Matthew Welch (Taylor Tate’s upcoming Ma), Jon Briddell (The Resident), Josh Daugherty (We Were Soldiers), Evan Castelloe (Queen Sugar) and Jesse C. Boyd (Hap and Leonard). As the inspiration for Nancy Drew and the Hidden Staircase, Nancy Drew has intrigued and entertained audiences for nearly 90 years in books, comics, films and video games. An icon in American mystery novels, the character initially appeared in 1930, evolving through each incarnation to reflect the look, sensibilities and technologies of the times. Nancy Drew books have sold more than 100 million copies, and have been translated to accommodate young readers across the planet. A number of feature films and television series have featured the character, starting with Nancy Drew … Detective in 1938. The character last appeared on film in the 2007 release, Nancy Drew, which starred Emma Roberts. No release date has been set for Nancy Drew and the Hidden Staircase. Elen DeGeneres movies Nancy Drew and the Hidden Staircase preview Red 56 Warner Bros.
Labels: Elen DeGeneres movies Nancy Drew and the Hidden Staircase preview Red 56 Warner Bros.